Each type of product made in bakery has a gross margin which is the difference between the selling price and the cost of the product. This bakery gross margin percentage calculator will help you to estimate the gross margin percentage of each product for use in the Financial Projections Template, when considering how to start a bakery business. The gross margin is used to calculate the gross margin percentage which is an indication of how profitable a bakery product will be. If your bakery has multiple products simply use the calculator for each product and then average the margin using our weighted average gross margin calculator. Enter the product description. For example, blackberry and toasted hazelnut muffins. Enter the batch size. This is the quantity of each product made by the recipe. For example is twelve cupcakes are made by the quantity of ingredients listed in the recipe, then the batch size to enter is 12. Enter the recipe quantity and description. The quantity of ingredient used in the recipe for the batch size to be made. For example, if 250g of plain flour are needed, enter 250, or if 8oz of flour are needed enter 8. The units must be the same as the units used when entering the bulk quantities below. Enter the bulk quantity and bulk cost. This is the quantity and cost at which the bulk ingredient is originally purchased. For example, if flour is purchased in 1 kilogram packs at a cost of 1.20, then enter 1,000 grams and 1.20. The units for the bulk quantity must be then same as the units for the recipe quantity. 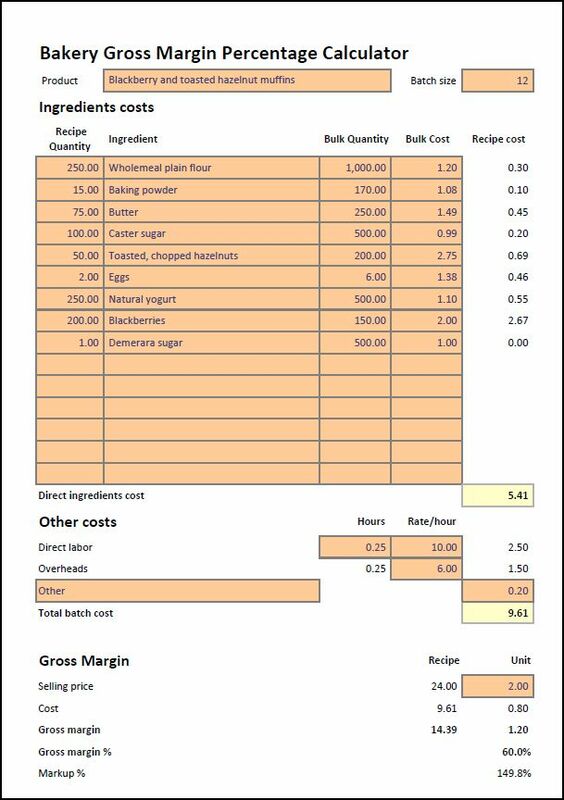 The bakery business gross margin calculator calculates the total cost of ingredients for the recipe. Enter the labor hours and rate If labor is to be included in the calculation, enter the number of hours required to process the batch and the hourly wage rate. The bakery gross margin percentage calculator calculates the direct labor cost to produce the batch. Enter the overhead rate. If overheads are to be allocated to the product, enter the overhead rate allocated for each direct labor hour. For example, if the total overheads of the business for a period are 20,000, and the direct labor hours for the same period are 3,333, then the overhead allocation rate is 20,000 / 3,333 = 6.00 per hour. The bakery gross margin percentage calculator calculates the overhead allocated to the batch. Enter details of other costs to be allocated to the batch. This is a space to enter any other costs such as setup costs for the batch if significant. The bakery calculator calculates the total batch cost. Enter the selling price of the product. This is the price to the customer excluding sale tax for each product. The bakery calculator calculates the cost, gross margin, gross margin percentage, and markup percentage for both the product and the batch. The bakery gross margin percentage calculator is available for download in Excel format by following the link below. 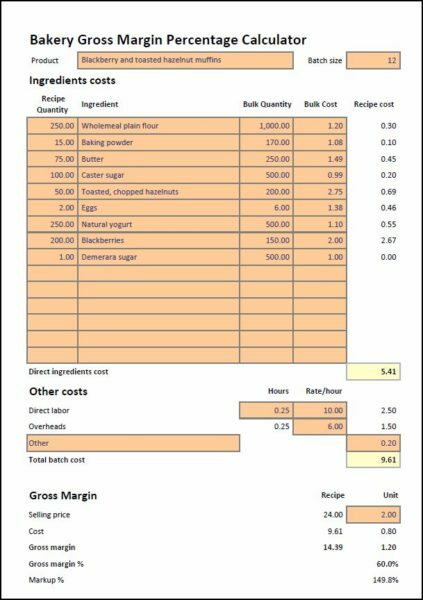 The bakery gross margin percentage produced by this template can be used as the starting point to calculate the break even point for a bakery and for our Financial Projections Template, as part of a bakery business plan. Users use the recipe cost spreadsheet at their own risk. We make no warranty or representation as to its accuracy and we are covered by the terms of our legal disclaimer, which you are deemed to have read. This is an example of bakery forecasting software that you might use when considering whether to open a bakery. It is purely illustrative. This is not intended to reflect general standards or targets for any particular company or sector. If you do spot a mistake in the bakery cafe business plan template, please let us know and we will try to fix it.